Rep-Cal's HERPTIVITE is a superior multi-vitamin, multimineral and amino acid food supplement developed from the latest findings in reptile and amphibian nutritional research. Its formulation contains all natural source ingredients with a base of "sea vegetation." 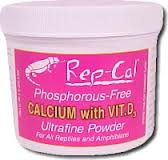 Unlike other companies which use non-nutritional "bases," Rep-Cal's "sea vegetation" base is rich in essential trace elements and minerals. HERPTIVITE contains precise levels of vitamins and minerals combined in perfect balance to ensure correct utilization of protein and other essential nutrients for growth, reproduction, maintenance and many aspects of your reptile's bodily functions. 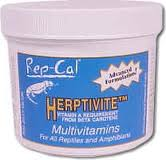 HERPTIVITE is the first reptile vitamin without Vitamin A. Instead we use Beta Carotene which is an anti-oxidant that is converted into Vitamin A in a regulated way, so there is no threat of Vitamin A toxicity.